Thank you for supporting Hope in the City and Hope For the Nations with your donations. You’ll learn about several ways to donate below. At HITC / HFN, we value living a debt-free lifestyle. While we accept donations via credit card accounts, it is our desire that no one incur debt by giving in that manner. Also, please be aware that credit/debit card processing fees of 2.75% + 45¢ (or 3.50% for AmEx cards) will be deducted from your gift before it reaches the selected account. When you’re greeted with the “We’d love to have you back!” message, enter your email address a second time to create a recurring-gift account. Text antiochatx to 73256, click the secure link that is sent back to your phone, and follow the steps to enter an amount, select a fund, and provide your bank or card account information. The most efficient, lowest cost method to donate electronically is via automatic withdrawals from your bank account. These withdrawals are scheduled for the 5th or the 20th of the month. To enroll, download and complete the following form and return it to our accounting staff. Personal checks and cash may be given in person during our Sunday morning services, or left at our office at any time during our normal business hours. You can set up in-kind gifts (unused gift cards, electronics, furniture, cars, boats, etc.) through iDonate. Simply click the appropriate link below to get started. 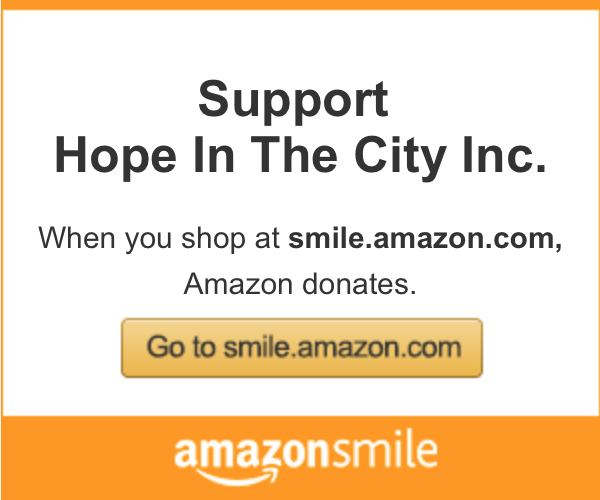 You can support Hope In The City when you shop at amazon.com by specifying our Smile account … just click below and shop away! For more information or questions about giving, please contact the Accounting team or call 512-892-4673.